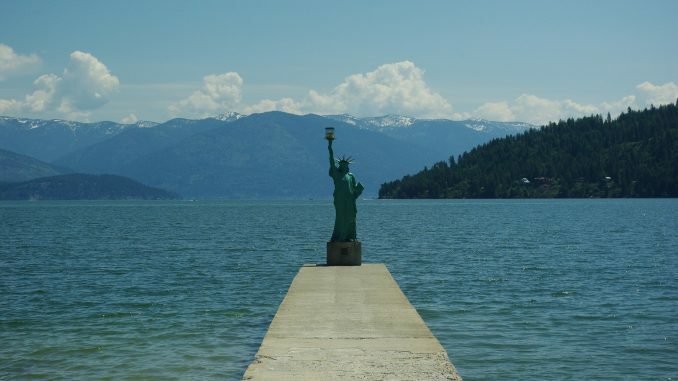 Small Statues of Liberty are fairly common in the United States (and around the world), but Sandpoint, Idaho has given their Lady Liberty an especially scenic backdrop by standing her at the end of a pier in Lake Pend Oreille. At 1/50th of the New York version, the Sandpoint Statue of Liberty is however a little more petite. A gift from the Turner Family in memory of Louise (Lee) Turner, the statue has been holding down the end of the pier since 2003. For many years the statue lived in the private garden of Ms. Lee Turner, the owner of the well-known Cowgirl Corral in Ponderay. After her death, the Turner family gifted the statue to the city and it has since become a somewhat popular tourist attraction and photo opportunity. Standing much like Lady Liberty in New York, the Sandpoint Statue of Liberty welcomes in those arriving to her shores.